The practice of this principle is very easy to follow and to implement, and is on nearly every kart/ vehicle etc. The explanation isn't much harder but I won't bore ye too much. Firstly the steering arm is the piece of metal that is usually welded to the front stub axle and enables the front steering wheel to be pointed in a particular direction. If you take a look at the following picture below you can see exactly what the steering arm is. 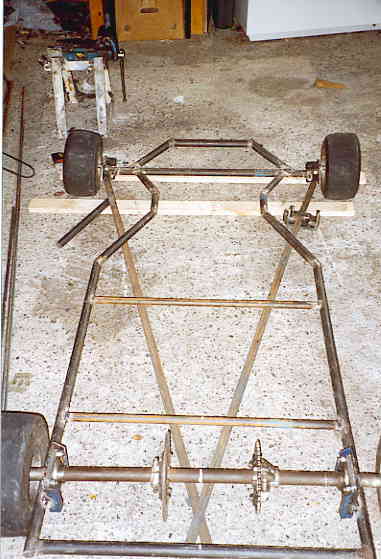 In the picture to the left you can see the steering arm welded to the yoke which allows the wheel to pivot and corner. However if you look closely at the photo you can see that the steering arm isn't welded at 90 degrees (right angles) to the yoke adjoined to the stub axle. There is a special angle here and it is unique to every kart. The Ackerman Angle is what ever angle is formed by the line running from the main kingpin on each side of the front of the kart to the very centre of the rear axle. 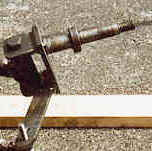 As in the photo above the angle was obtained and the steering arms were welded to the yoke/ front stub axle maintaining this angle. The steering arms are firstly however cut to the appropriate length, you may see from some of my photos throughout this site that I have drilled two holes at the ends of both steering arms. This is in case a particular driver prefers a more abrupt turning of the kart with little turning of the steering wheel and visa versa. I have to say however I have not changed it and I have left it at a standard of around 150mm, that is the distance from where the arm is welded to the kart and the hole for the connecting bolt. Incorporating this steering angle into the kart will improve it's cornering, without this angle the kart won't take corners smoothly and will increase tire wear. Using this angle allows the two front wheel to turn by different amounts so that the tracks of the two front wheels are not the same. If you are confused, don't worry it's not that essential to know about it, just only that it works.